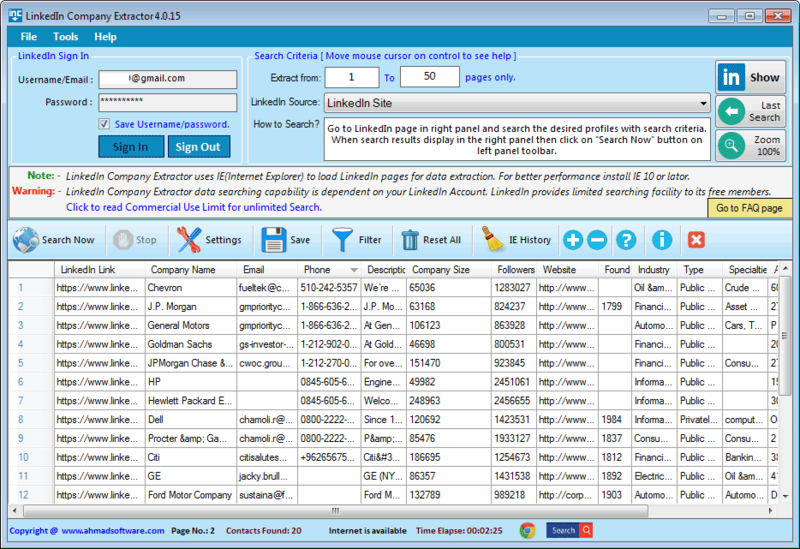 LinkedIn Company Extractor is a desktop application which allows you to extract companies' profiles from LinkedIn and Sales Navigator at an exceptionally fast rate. It automatically extracts LinkedIn profile link, business name, email address, phone number, company size, followers, website, year founded, industry, company type, specialties, address, postcode, and country name etc. LinkedIn does not provide company email address and phone number therefore software extracts company email and phone number from google (if available) based on company name. You can export your data in .xlsx, .csv,(opens in excel) .txt files. Why Use LinkedIn Company Extractor? LinkedIn has been creating buzz in social media circles for many years now, however many businesses are yet to fully capitalize on this remarkable tool for their online marketing and promotional needs. LinkedIn Company Extractor is the best tool to get companies information from LinkedIn according to your business needs. LinkedIn Company Extractor can extract your targeted companies' information from Linkedin. Lead Extractor searches your targeted companies based on your search keywords. Using LinkedIn Advanced search feature, search for companies by keywords, industry, location, company, and more. LinkedIn Company Extractor has the ability to save the history of viewed and saved companies so that already saved companies profiles should not view again. Option to set delay between requests to simulate as a human being is surfing in a browser. LinkedIn Company Extractor support Unicode character-set. You can save fetched search results in Unicode format. LinkedIn Company Extractor automatically pauses/resumes on internet failure during processing. Sales Navigator: 1,000 profiles daily.